Dealing with one or more missing teeth can be an embarrassing situation. Dental implants can provide patients with an ideal restorative solution that can both replenish your smile and boost your self-confidence. Dr. John A. Carollo specializes in dental implants here at his Florham Park, NJ practice, and our team always takes the time to ensure that you have a comfortable and unique experience. We will formulate and discuss an individualized treatment plan to help you achieve the revitalized oral health you’ve been searching for. 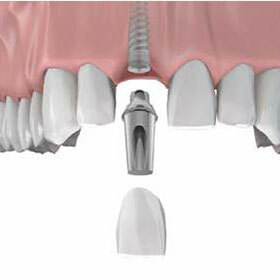 For patients who are missing one tooth, dental implants can help complete their smile in a truly exceptional manner. A single implant can be placed very precisely in the appropriate socket without requiring the surrounding teeth to suffer negative health benefits, and the new restoration will look and function normally – no changes to your diet or oral hygiene routine required! Better yet, your new tooth root will help sustain and even rejuvenate the health of your jawbone, which can deteriorate due to tooth loss. The Teeth in a Day procedure (using the All-On-4™ technique) is the optimal solution for patients who have lost or are about to lose all of their upper and/or teeth. This treatment option allows you to come as close to having a new set of permanent teeth as is currently possible. Patients can clean and maintain their new smile just like they would natural teeth, and they no longer have to struggle through the negative qualities of traditional dentures, such as slippage, messy adhesive, or bad breath. 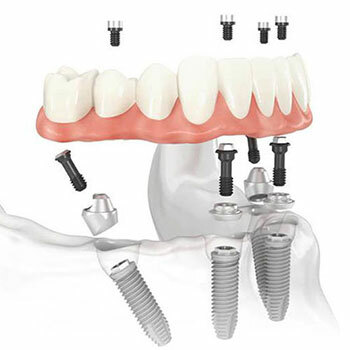 The A-on-4™ technique consists of a prosthesis that is supported by four strategically placed dental implants. These implants are designed for immediate function and do not require bone grafting, meaning that even patients who lack the bone volume required for traditional implants can enjoy instant and permanent satisfaction by being able to go home that same day with a brand-new set of teeth. When was the last time you were able to bite into a crisp apple or a juicy steak? Now, with a stable and permanent restorative solution, you can enjoy your favorite foods again. Enjoy a boost of self-confidence from having a stable smile again. All-on-4™ technology makes permanent teeth more affordable than ever before by simplifying your treatment down to only four implants per arch. You no longer have to deal with the many frustrations associated with removable appliances. They create a new, youthful appearance by stabilizing your jawbone health. We can ensure long-term results that have the potential to last a lifetime with good oral health maintenance and scheduled check-ups at our New Jersey practice. One of the most common roadblocks patients face when pursuing traditional implant treatment is being told that they have insufficient bone volume to support the implants. 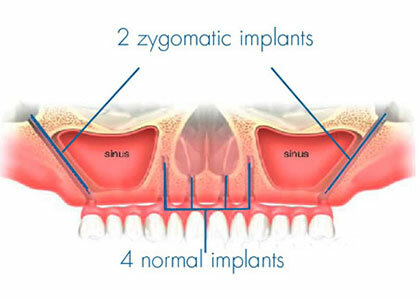 Instead of electing to undergo time-consuming and costly bone graft surgery to correct the problem, though, why not choose Zygomatic implants? This revolutionary dental implant technique eliminates the need for bone grafts altogether by instead having the implants directly embedded into your cheekbone, where there is enough bone support. With this procedure, patients heal much faster, and treatment time is minimal, as the whole process is guided by computers. Contact the office of Dr. John A. Carollo today to schedule your FREE implant consultation! We look forward to improving both your oral health and your overall quality of life through our transformative dental work.